In 2014/15, the HSE (Health, Safety Executive) research showed that 16 million people were experiencing mental ill health problems each year and stress was a key factor with 440,000 people (40% of all work-related illness) in the UK reported work-related stress at a level they believed was making them ill. A poll that You HR recently ran showed that an overwhelming majority found workload caused them the most stress. The Mental Health Foundation reports that 74% of people have at some point felt so stressed that they have felt overwhelmed, unable to cope, and some individuals’ report that their stress levels have led them to feeling depressed. Research by Mind has found that work is the most stressful factor in people’s lives, with one in three people saying their work life was either very or quite stressful, more so than financial or health problems. The survey also found that workplace stress has resulted in 7% having suicidal thoughts and one in five people developing anxiety. The evidence is there, so what can we do about it? Long commutes, unsociable working hours, workload, problems with finances or unexpected life events are some of the most common reasons why people are getting stressed. Being under pressure is part of normal life. It can be a useful drive that helps you take action, feel more energised and gets results. But if you become overwhelmed by it becomes a problem. 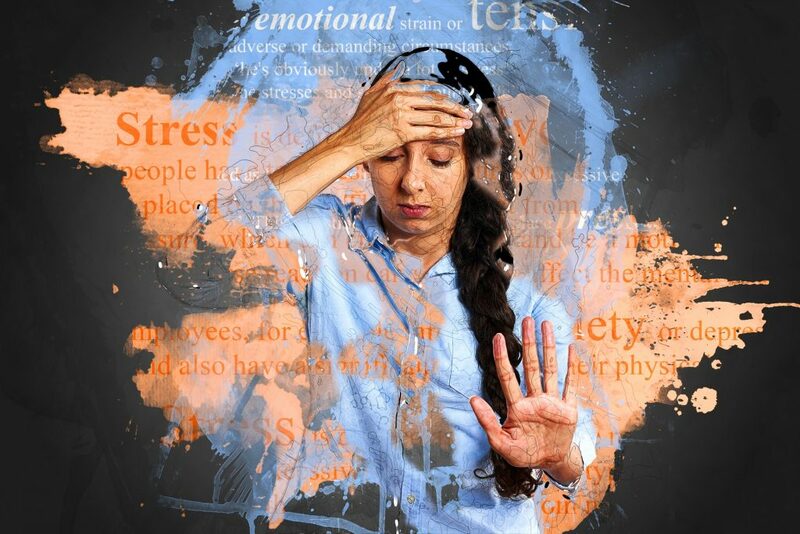 Stress is not a psychiatric diagnosis but is linked to your mental health in important ways and can seriously interfere with your job, family life, and health. By tackling stress employers can do so much to proactively raise mental health awareness and support those in the work place that experience mental ill health problems such as anxiety and depression, and, prevent more tragic circumstances that may lead toself-harm or even and suicide. The Mental Health Foundation provides an easy way for employers to engage with the resources they have made available to tackle stress and help improve our mental health and wellbeing. April is Stress Awareness Month and is a great opportunity to start the conversation with your staff about mental health and stress in the workplace and raise awareness for managers about the signs and symptoms of mental ‘ill’ health, equipping them with training so they can support staff. Some main areas that can lead to work-related stress if they are not managed properly. These are: demands, control, support, relationships, role and change. Stress affects people differently – what causes stress in one person may not affect another. External factors such as skills and experience, age or disability may all affect whether an employee can cope. The day-to-day demands and pressures of work should not be a barrier to good mental health. If you want to attract and retain committed employees, prioritising the mental health and wellbeing of your staff needs to be core business in your organisation. You can make this happen by working with your employees to create a workplace and culture where everyone feels valued and supported. If employees start acting differently, it can be a sign they are stressed. Managers should look out for signs of stress in teams and employees, such as those listed below. Think about whether the stress could be linked to work pressure. Acting early can reduce the impact and make it easier to reduce or remove the causes. If managers are worried that an employee is showing some of these signs, they should encourage them to see their GP. These signs can also be symptoms of other conditions. If there is something wrong at work, and this has caused the problem, managers should take action. Consider ‘walking meetings’ found to encourage creativity and allows workers to be more active in doing so. Make time for tea – encourage time out for colleagues to discuss their wellbeing in a more relaxed environment. Social time together outside the workplace encourages good team camaraderie which in turn can encourage colleagues to share any issues that may be causing them stress. Regularly check the working environment. Is it comfortable for employees? Could simple improvements be made to reduce noise or lighting issues? Ensuring bullying and harassment is not tolerated within teams. At You HR Consultancy our strap line is ‘it’s all about the people.’ We are able to offer you support and guidance regarding your employee’s health and wellbeing through our individualised organisational ‘health check’ and service offering that is tailored to meet your individual organisations requirements. 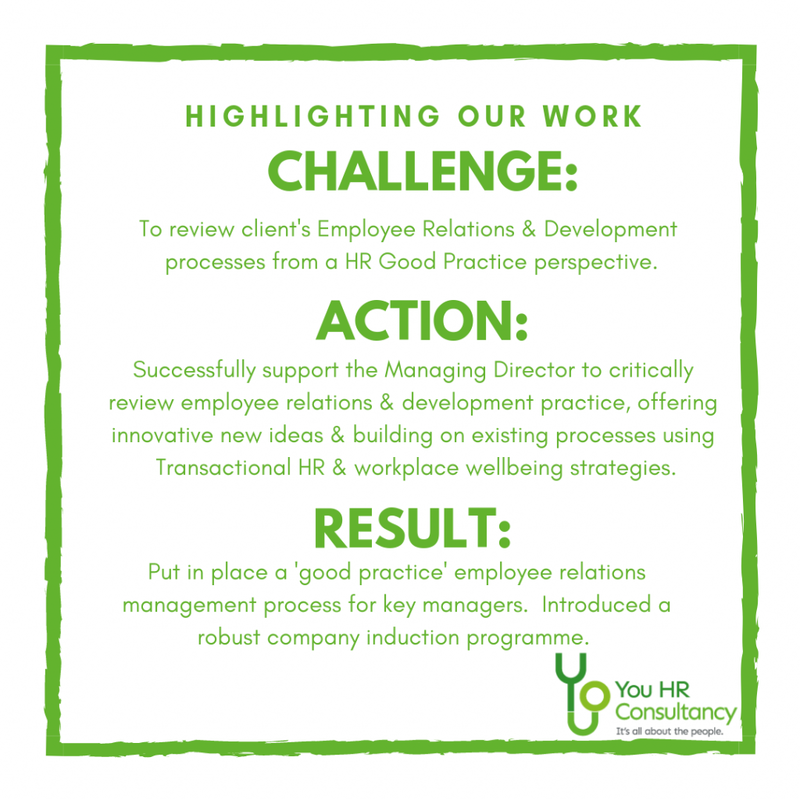 You HR Consultancy offer a range of interventions within our Workplace Wellbeing Service Line including workplace wellness strategies, engaging and involving your people, employee assistance programmes and bespoke counselling.